Running as the inevitable nominee, then inevitable President because it was your turn didn't work for Hillary in '08. Until some dirty tricks within the DNC, it might not have worked in '16 either. Team HRC would have been smart to let the nomination race conclude organically (without institutional interference). The folks who Bernie Sanders brought in from the outside, returned to the outside after he was ousted from the contest. Who's to say, but if he lost to her in a fair and transparent way, those folks could have been the extra 4-5pts that would see her with a 370+ electoral vote win instead of losing to Donald Trump. Two. Economic voters are still economic voters. Obama campaigned on the economy in '08 and won. Again in '12 as the economy was finally growing again. I hope Hillary Clinton wins on November 8. I hope she clobbers Donald Trump in the popular vote, and the electoral votes. I hope Democrats win a filibuster proof majority in the Senate, and retake the majority in the house. I hope Democrats win state houses up for grabs, gubernatorial contests so that gerrymandering can be rolled back. I hope Hillary wins, not because I'm particularly won over by her, but that it proves that America isn't insane. To be clear, Hillary is a flawed candidate. She's proven more adept at the game and not the results. That's why she lost to Obama in '08 but why she'll win against Trump. I would have preferred Bernie Sanders as the Democratic candidate, but that's just not the way it goes. Mostly, if Hillary Clinton wins, she will force the Republican party to burn itself to the ground in order to start again. As Obama was taking the oath of office in January '09, GOP leaders were plotting their way back to power. Their plan was to simply say "no" to everything that Obama was in favor of. If that meant gridlock in Congress, then so be it; they'd prefer government shut down than to compromise with the President. In fact, they've done that twice since Obama's first election win, and are making noise as if to deploy the same strategy against Hillary Clinton should she (likely) win in November. Hillary Clinton may win by a landslide, but her win will be pointless without flipping control of Congress away from the GOP as well. Until the backwards thinking Tea Party movement is beaten out of the Republican party, they cannot be trusted to govern effectively or governm for the whole nation instead of their narrow minded agenda. It was a lesson that was supposed to be learned from '12 for Republicans to better reach out to Latinos, blacks, etc. Romney won 61% of the white vote and it wasn't enough to win outright. America has changed so much since 1988 when Bush Sr. won 400+ electoral votes and 61% of the white vote. The point is that the Republican Party was to reach out and build bridges if they wanted a chance again at winning the Whitehouse. Instead, they got Trump. Trump. Build a wall along the Mexican border, Trump. Until Republicans eschew the tea party movement and move moderate, they'll never win again. On top of every other complicating matter that makes me not support the PNW LNG project, the tax and royalty regime now in place are so low that it almost qualifies as a taxpayer supported subsidy. Petronas, is a state owned corporation in Malaysia. Also, both federal and provincial governments have green lighted the potential use of temporary foreign workers for this proposal. This is notwithstanding some very serious issues regarding a requirement for meaningful consultations with the affected first nations' in the region. Yesterday, late in the day, Peter Fassbender attackedthe NDP for pledging to increase the provincial share of transit expansion through the 'mayors 10 plan' from a 33% to 40% share. Translink Minister Fassbender has a short memory on finding cash for short term political gains. Bonus: the Provincial government demanded some parents/families pay this back. 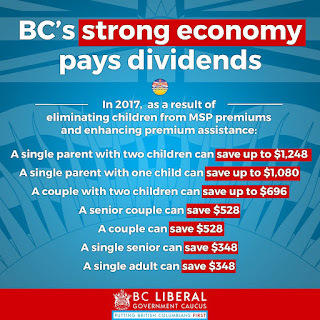 The BC Liberals are on their typical pre-election spending spree and promise making. Today it was their pledge to cancel the planned 4% hike to MSP premiums. This amounts to an extra $3 per month that won't be charged any more. Predictably, the governing party is making a lot of noise about this after having a rough go of it lately. Almost as if it was planned this way, that if the criminal probe didn't implicate an actual sitting MLA or Premier, that it was going to be no big deal. Wrong. Its a big deal. 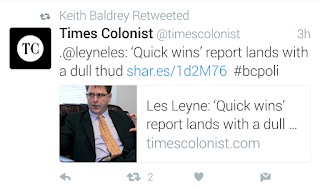 An alternative headline would be: "Another criminal charge against Clark insider speaks to culture of corruption in 16 year old govt". 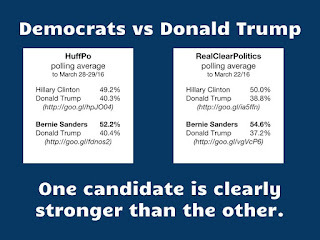 Hillary would win against Trump, Bernie would crush him. VOX media contributor Ezra Klein makes a case that Trump is a losing candidate for the GOP. He demonstrates this using a chart that prominently reveals the billionaire losing ground to Hillary Clinton. No chart showing what a Trump vs Sanders contest would look like. Just Hillary. The trouble is that this sort reporting is exactly the kind of problem in American politics that Bernie Sanders is running against. Spoiler alert: I can't vote in any US election, primary or otherwise, being a Canadian citizen. But that doesn't stop me from saying that if I were American, Bernie would be my choice. Its not that I dislike Hillary Clinton, its that she is representative of a political machine and philosophy that is broken. Don't get me wrong, I identify with many planks she represents, but the political baggage she carries is the same trash that's infected so many other otherwise well-meaning politicos over the generation. I'm not generally a high-tax kinda guy. But I don't necessarily have a problem paying them. What I oppose is how my tax dollars are spent from time to time. Bernie isn't advocating trillions of dollars in "new" free stuff. In fact, its not that at all. He is just stating that the free stuff handed out by the other folks is not the free stuff he believes as relevant priorities in today's world.